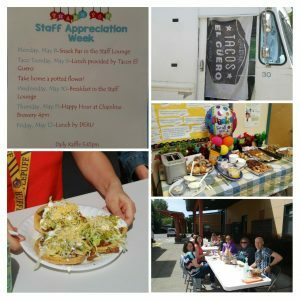 Staff Appreciation Week is held annually in May at Lakeview. It is a very special time at Lakeview. It’s our opportunity to thank the wonderful people who educate & care for our children. 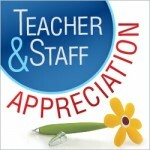 Please join the PTSA in showing our Lakeview Staff how grateful we are for all they do for our kids! A homecooked staff breakfast. Items can be dropped off at the school as early as 7:00am, staff usually starts arriving around 8:00am. Afternoon snack bar for the staff. “Adopt” a staff member. This is for our non-classroom teachers who support the whole school. Individual classrooms are welcome to shower their teachers with thanks as determined by each room parent. Cards, flowers, etc. are encouraged but not required and class gifts should be limited to $40.